Don't ask me why but pictures of barber shops have a certain something. Maybe because both client and barber look so concentrated. The client telling the man the story of his life in a sort of confessional with no curtains or lattice partition. The barber doing his job with an eye on the haircut and his mind on his client's speech. Everybody knows that barbers are mixture of priest and psychologist. My God, the things you get to confess to your barber. This barber shop in particular you find at carrer Casanova, 96 in Barcelona. A good reminder that I should visit my barber next week. We often talk about my photography and some of his hobbies, he is building a house this year and I will probably try to document that. Interesting "action shot". I like daily life/ work places. It is a marvelous view into the barber shop. 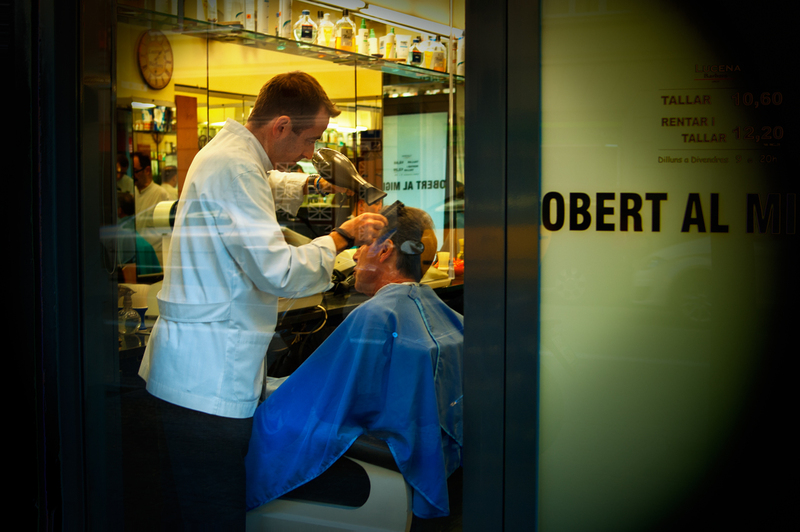 I have always thought of barber as being a proud profession, clean and serious. This image shows what I have felt. Oh very well done! One of those in-temporal photos! I must confess, I also have a thing for barber pics. Thanks for the recommendation. Looking for a barber for my husband. We'll be traveling to Bcn from CT.